Homemade Kimchi for Fermentation Fun! We love DIY (do-it-yourself) projects here at Green Living Ideas: making things at home to help keep our bellies full, our houses clean and planet green is super fun and inspiring! Across our network we’ve got recipes for homemade vegan water kefir, homemade body care products, homemade breads, even homemade drain cleaner! Today we have an edible recipe for a great homemade staple: Homemade Kimchi (also spelled kim chi). I love making homemade ferments! If you’ve ever eaten at a Korean restaurant, you’ve probably seen a side dish made from cabbage that is spicy red-hot and DELICIOUS! Kim chi, usually made from cabbage, ginger, garlic and spices, is a naturally fermented, spicy cabbage side dish that is served with every meal in Korea. Not only is it crazy delicious, it’s a great source of natural probiotics from the fermentation process and loaded all the goodness of raw, healing foods. Find four other awesome easy fermentation projects here! The kim chi, ready to ferment! There are as many Kim chi recipes as there are Korean grandmothers. Kim chi ‘recipes’ are interesting because they all have a slightly different approach. Some say to brine the vegetables, others say to simply let the cabbage stand in salted water; root vegetables, onions, fruits and many other ingredients also make an appearance in other kim chi recipes. The point is, none of them are really ‘right’ but they will all work, giving you slighty different results each time, each season. That’s part of the fun of homemade fermentation! Some of the sources I used are fermentation expert Sandor Elix Katz, nutritionist Sarah B. from My New Roots, raw food goddess Ani Phyo, and EcoKaren, who offered her expertise when I posted my experiments on Facebook! 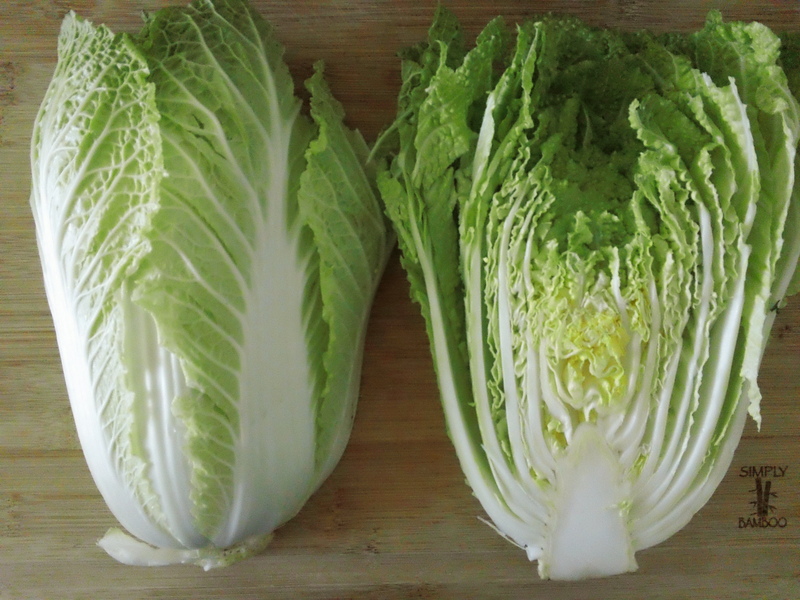 You will need a good bit of Napa cabbage- the slightly curly kind, not the round head of green cabbage (see photo below). Get a large head, one that’s free from wilting and bruises. You will also need ample amounts of garlic, ginger, fine ground sea salt and spicy red pepper. I headed to our local Korean market for some gochugaru, but regular crushed red chili flakes will work too. You will also need some 1-liter mason jars, maybe three or four. Have them sterilized and ready to go before starting your kim chi makin’. Have sanitized wide-mouth jars and lids ready for use (at least one quart jar per 2lbs cabbage; see How to Sanitize Jars for Fermentation projects here). Place cabbage into a large bowl. Sprinkle with 1 Tablespoon of salt and toss together. Add any extra vegetables, garlic, ginger and chili powder. Toss together again and sprinkle on some more salt. Let stand for five minutes until salt begins pulling water from the veggies, creating a natural brine. If it seems dry after a few minutes, add a bit more salt and massage the cabbage to release the liquid. Once cabbage mixture has reduced and there is a little bit of brine at the bottom of the bowl, pack into sterilized jars. Press firmly as you go (with your hands or with a tool), making sure the cabbage is packed tightly. Leave about an inch of space at the top of the jar, and make sure that the cabbage is covered completely in the brine (liquid). If it is too dry, mix 1 teaspoon of salt with 1/2 cup water, stir to dissolve, and pour onto cabbage until it’s submerged (you can do this anytime during the fermentation process that you see the brine level drop). At this point methods differ: you can cover the jar with a lid, opening every day to let out excess carbon dioxide. I prefer to use a smaller (sanitized) jar atop the cabbage, which ensures that the cabbage remains submerged in the brine. Leave jar on at room temperature (probably on the kitchen counter) for seven days, being sure to check the brine levels every day, adding more if needed. Using clean utensils, taste each day for tanginess and let it ferment longer if you like. There might be bubbles- that’s good! Refrigerate after opening– it will keep for a long time! Use your kimchi in miso soup, fried rice, tofu scrambles and so much more! You can mix all your veggies together, or brine the cabbage separately. If you don’t want to ferment it, it tastes great just like this! Once your cabbage has been salted, it will lose most of the volume and be ready to be placed into the jar.